This filling dish that resembles the taste of a juicy meat lovers pizza is available at any Jacksonville Jumbo Shrimp home game at the Baseball Grounds of Jacksonville for $18. 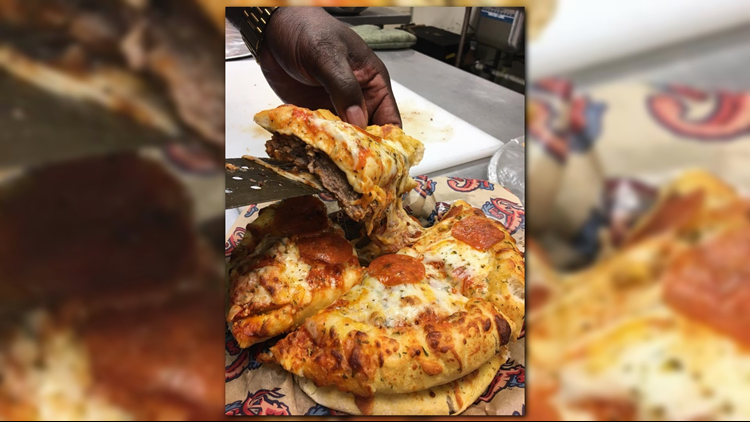 JACKSONVILLE, Fla. - Take one pound of a burger patty, put it between two personal pizzas and what do you get? A popular ballpark dish: The Bold City Burger Pie. Before your jaw drops at the price, know that you'll get a big quantity of food that could feed an entire family of four, making the dish worth the price, said Earnest Hopkins, the director of food and beverage and executive chef. "I haven't seen a family of four eat it all yet," Hopkins said. The Bold City Burger Pie is a popular dish at Jacksonville Jumbo Shrimp home games, costing $18 and feed a family of four. It consists of a pound of burger in between two personal pizzas. Photo: FCN. Hopkins said he was inspired to create the dish after he attended an Atlanta Braves game and saw a similar concoction. "I wanted to bring it back here to the local community and put a little twist to it," he said. First, you season the pound burger patty on both sides, add it to the grill and cook until it's done. While that's cooking, make two personal pizzas (The top pizza "bun" has pepperonis if requested) and cook until they're done. Once both the burger patty and pizzas are ready, you add cheese (optional) on the burger and place the patty between the two pizzas. Then, it's ready to serve. Some may be overwhelmed, unsure of what it tastes like, but Hopkins said "don't be afraid to try it." The Bold City Burger Pie is available at the Sweet Tebow's stand on the third-base side of the ballpark. Of course, what is a Jumbo Shrimp game without some shrimp menu items? This baseball season, Hopkins said they introduced a new, non-traditional shrimp dish: shrimp and pulled pork nachos. It's served in a plastic Jumbo Shrimp hat and consists of nachos, pulled BBQ pork, Mayport shrimp, jalepeños and nacho cheese. 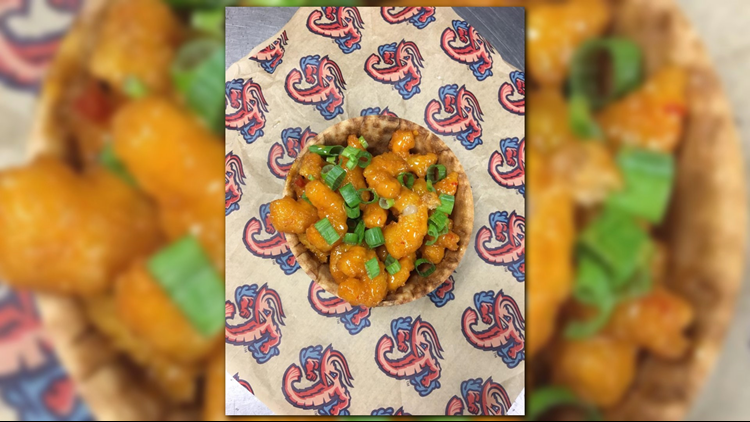 Boom Boom Shrimp is a fan favorite offered at Jacksonville Jumbo Shrimp home games and costs $10. Photo: FCN. But their most popular shrimp dish, according to Hopkins: The Boom Boom Shrimp, which is served in a waffle bowl. It was introduced the first season the team was renamed the Jumbo Shrimp. "The sauce is a little sweet, but not too spicy," Hopkins said. "It's one of my favorites because it's a fan favorite. By me pleasing the fans, it's a personal inspiration." It's available at the Southern Fried Free Bird stand for $11, which is on the third-base side of the Baseball Grounds. Most of their seafood items are available there! "One thing I like about our ballpark is the different choices we offer fans here," he said. "We're not your typical ballpark that's heavy with burgers and hot dogs. We try to have different things for everyone to enjoy." Melissa Guz is a digital content producer and content creator of First Coast Foodies. Be sure to check out her exclusive online First Coast Foodies videos posted on our Facebook and the First Coast News. Don't forget to also follow her on Twitter (@mguznews) and Instagram (@fcnfoodies).